To be safe, when visiting Puerto Rico bring a complete list of your medications, do not assume you can get a refill of a prescription here, and assume you will be “out-of-network” while on the island. Double check if your insurance covers emergencies in Puerto Rico. Travelers insurance is a good idea if you have health issues or are accident prone. 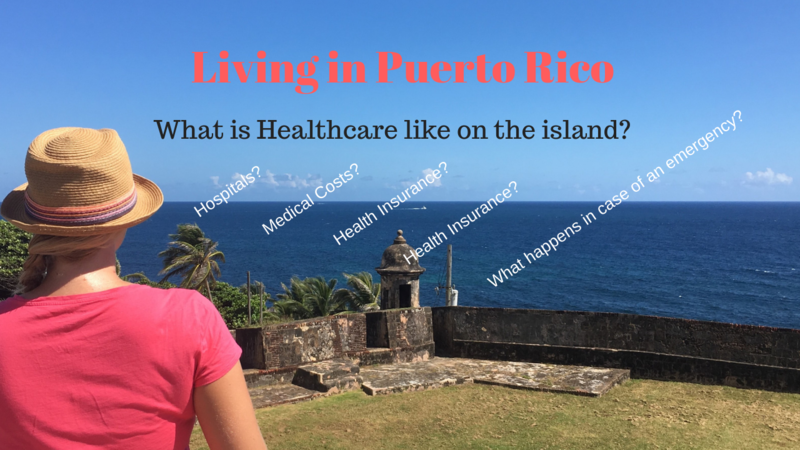 As soon as we moved to Puerto Rico, we gave up our US based health insurance and signed up for the far less expensive, better coverage Puerto Rican health insurance plan. My previous US based insurance (self employed) was over $350 per month, and my new Triple S (Blue Cross Blue Shield of Puerto Rico) insurance in Puerto Rico is $180 per month now. My insurance is widely accepted around the island, it has low co-pays, many $5 co-pay for prescriptions, and high coverage. The doctor lists provided and maintained by health insurance companies on the island are outdated and contain wrong information. The best way to find a good doctor is to ask friends and neighbors. There are Doctors and medical facilities located all around the island, but my personal experience is that the best doctors and medical care are in the San Juan metro area, some of these Doctors may also have offices in/around Ponce. I highly recommend Salus clinic for Triple S insured patients. The website has good information, and while it states that they take online appointments, that is a lie. You must call and make your appointment. There is a paid parking lot near the front entrance of the clinic, and the laboratory is on-site for one-stop medical care. One of my Doctor’s office is located in the Maramar Plaza of San Patricio in Guaynabo. This was a referral from my Primary Care Physician, otherwise there is little information online about my Doctor and the other medical offices located in the building. There are 20 medical practices located in this building, at least that is what is listed on the sign for directory information posted on the elevator door and in the lobby. Like most things in Puerto Rico, it is difficult to obtain information in general, there is little to zero information online, and often the only way to get information is to physically go there in person. The “country” medical offices around the island tend to look run down and often have the appearance of an abandoned building. There may only be a couple parking spaces, or none at all. Many of these offices only have one Doctor on staff, they tend to be very overcrowded and rarely take appointments. Patient medical forms tend to only be available in Spanish and maybe one English speaker on staff, maybe none. Bring cash, not all Doctor’s offices accept payment for co-pays via credit card. San Juan and surrounding areas of Bayamon, Guaynabo, and Condado tend to have nicer, more modern facilities. These are the medical practices with more than one Doctor, modern equipment, on-site parking (paid or complimentary), medical forms available in Spanish and English, and more English speaking staff. Many of these facilities offer appointments or an appointment window (Example, 6 patients between 1-2 pm, first come first serve). In general, most Puerto Rican medical facilities do not follow any kind of patient privacy or HIPAA guidelines, I am not even sure if they are required to. Patient sign in is visible to everyone, and there is no indication of privacy and security of health information. They avoid the standards for electronic exchange by doing everything manually and there are very few electronic records. Much like banking, medical information in Puerto Rico is stuck in the 1980’s for technology. Do you want to see what it is like to go to the Doctor in Puerto Rico? Here is a video of my experience, frustration, and helpful tips for doctor office visits in Puerto Rico. Laboratory facilities are located throughout the island. There is no appointment necessary, first come first serve basis. Many Lab technicians are bilingual. The biggest difference between labs is how quickly they complete the test and have results completed. Bring your prescription for lab work into any lab facility. Sign in, take a seat, and your name will be called pretty quick for co-pay and the laboratory tests. Before leaving, confirm when your lab results will be ready for pick-up. Unlike everywhere else in the modern world, lab results are not sent directly to the prescribing Doctor. You, as the patient, are expected to pick up your lab results and deliver them to the Doctor. When you go back to the lab and show your identification to pick up your results, then you need another appointment with your Doctor to review the results. In a rare case, my neighbor had a Cancer scare and the Laboratory rushed her tests and sent the (negative) results directly to her Doctor. I know many facilities have the ability, but for whatever reason, will not sent the results directly. This manual policy adds additional run-around for patients, and delays treatment. Recently, my friend’s sister came to Puerto Rico to visit. On the third day of her visit, she had a medical emergency that required a lengthy hospital stay and multiple ambulance rides. Jaime shares the story in this interview style video. In an emergency, call 911! They may put you on hold to find an English speaker. Asking a Spanish speaker to call for you could get a response faster and avoid any delay to locate an English speaker. Ambulance companies are privately owned and may require payment in cash before the patient will be transported to the medical facility. Emergency transportation will ask you to decide which medical facility for transport. There does not appear to be any coordination between ambulance and medical facilities to prepare for incoming patients or to recommend the best facility for the emergency or trauma. The patient is responsible to provide blankets, pillows, bed pans, and all hospital supplies. The hospital will only provide information on what and how many to bring, such as how many sets of clean night gowns. The patient’s family are critical to provide these items. Even the medicated cream for bed sores must be provided by the patient’s family. I have no idea what would happen to someone without a support system to provide these hospital necessities. The Doctors and Nurses are qualified professionals and they provided good healthcare that ultimately had a positive outcome. The healthcare providers work hard for patient care and genuinely cared about their patients. These are my personal observations and experiences and in no way should be taken as medical advice. I am not a Doctor or any kind of medical professional. So important and helpful. I wish more bloggers would provide information like this; even if the details have some variability, the generalities give you a flavor of what to accustom yourself to. I lived in Puerto Rico as a preteen, then later as a teen, and then much later in my 20s (so 3 separate times; the first 2 were as a dependent of my parents lol – and all of this long, long ago), I had new experiences each move. Largely, my experiences were that the doctors were knowledgeable, competent, warmhearted (I had a better word for it I can’t recall) and affirming, but there will be things to adjust to, as alluded to above. Outside lab testing took some adjustment on my part (insert dull story here), but in the end perhaps it lets you own your results and gives a sense of power back to the patient. Thanks so much for this update! So useful! My disclaimer is medicine is a bit scary for me anywhere! oh and also thank you for the informative yet respectful way of approaching this important topic!! Any medical service is a bit scary for me, too. I am glad you find the information useful. I can only imagine how healthcare has changed over the decades in PR.